In 1960, the world population was 3 billion, it is less than half of today's value.It means world populations doubled in last 50 years. According to United Nations estimations, it is 7.3 billion in 2015 and is expected to reach 9.4 billion in 2050. In every second 4.3 births and 1.8 death take place globally.30 percentage of births are accidental and undesirable mostly occurs is least developing countries.Poverty and lack of education are the haunting disasters being faced by least developed countries causing no knowledge of birth control methods and non-availability of contraceptive medical aids. While speaking about population, it is relevant to evaluate population density among countries. Macau is a former Portuguese province in China with an average of 20,497 people living within 1 square kilometer. Large countries like Russia and Australia, having very low population density, averages about 8 persons living in 1 square kilometer. This means Earth could possibly accommodate more people as the population increases. Also in Africa and Central & South Americas there are so many millions of square kilometers of unused farmable land. Studies show that if every person lives to the standard of the average American, there should be more than 2 Billion people on earth altogether. It is important to efficiently optimise utilization of resources in rich countries. According to UN Food and Agricultural Organization, one out of every eight people is hungry in the world right now. Lack of water and food, poor living conditions, faster spread rate of deadly disease, and lack of security are the foremost factors of poverty. 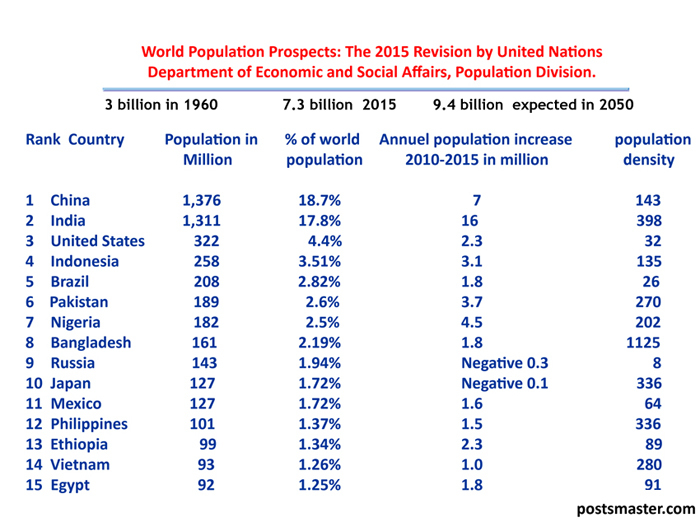 Uncontrolled Population growth gives rise to many other adverse results along with poverty; While Countries like Germany, Italy, Russia, and Japan showed negative population growth rates in 2014-2015. Everything is interrelated extremely. Controlled population growth cannot be achieved without adequate education to all people on the planet, especially in the least developed sub-Saharan countries, indicating the significance of equality.